Traveling this Labor Day Weekend? 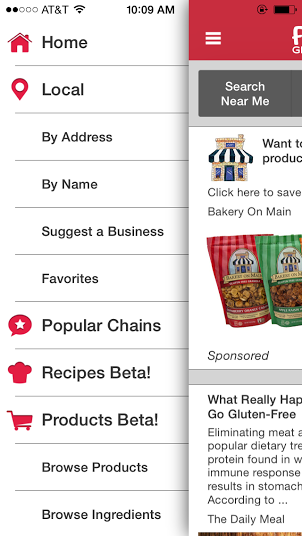 Use the Find Me Gluten Free mobile app to locate gluten-free-friendly businesses wherever you are! Below, we’re walking you through the best ways to search for restaurants as well as highlighting some exciting features you may not know about. Here’s to gluten-free eating! 2. Plan ahead and search for restaurants in the city you’re traveling to before you arrive! On the home screen, slide right to reveal the left menu (or tap the 3 lines top left). Tap “By Address” and type your destination. 3. View your search results by distance, rating or on a map. Tap “By Distance” on the top red bar to change your preferences. 5. Select a business and press “More” on the top right. Tap “Street View” to see the restaurant’s storefront or add the business to your “Favorites” list. 6. View your “Favorites” on a map. On the home screen, slide right to reveal the left menu. Tap “Favorites” and “Map” on the top right. Can you find restaurants by meal? I missed that, if it is there. Hi Sharon! You can filter your results by cuisine type. Tap “search near me” then “filter” on the top right corner. Tap “tag” and select the type of meal you are in the mood for (barbecue, burgers, etc.) Then tap “apply.” Happy searching! Thank you for creating this app. I used it for first time today and was able to locate a great place to eat near by! Broadway Pizza has a large variety of item to choose from.